All Procellariiformes are pelagic birds, which mainly feed on squid or fish and are characterized by the possession of tubular nostrils. The extant species are classified into four taxa, the Hydrobatidae (storm-petrels), Diomedeidae (albatrosses), Procellariidae (fulmars, petrels, shearwaters), and Pelecanoididae (diving-petrels). There is, however, evidence from morphological and molecular studies that the Procellariidae are not monophyletic but encompass the Pelecanoididae; likewise, monophyly of the Hydrobatidae, i.e., a clade including the Oceanitinae (southern storm-petrels) and Hydrobatinae (northern storm petrels), is not well based (Forbes 1882; Kennedy and Page 2002; Hackett et al. 2008). The distal humerus of the Diomedeoididae and Procellariidae bears a very prominent dorsal supracondylar process; this process is much smaller in the Hydrobatidae and in the Pelecanoididae (the humerus of the latter is modified owing to its use for underwater propulsion). Although the main distribution of extant Procellariiformes is in the Southern Hemisphere, most Paleogene taxa were found in European and North American fossil sites. This may be an artifact of the superior fossil record of the Northern Hemisphere, but it is notable that procellariiform birds are absent or very rare in Southern Hemisphere fossil localities which yielded numerous penguin bones. Procellariiformes in most features, but has a very small supracondylar process. Its affinities are uncertain and Bourdon et al. (2008b) considered it to be more similar to the Prophaethontidae (Sect. 7.11). All remains of putative procellariiform birds from early Paleogene deposits are also very fragmentary. Eopuffinus kazachstanensis Nessov, 1986 from the late Paleocene of Kazakhstan was described on the basis of a cranium fragment, which bears distinct, Puffinus--like fossae for salt glands (Nessov 1992). 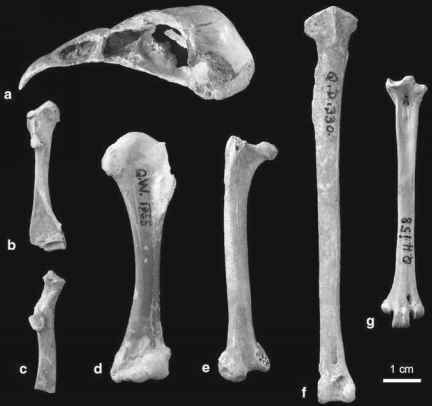 Presumptive procellariiform birds were also reported from the London Clay (Harrison and Walker 1977), but these specimens, a distal end of a humerus described as Primodroma bournei Harrison and Walker, 1977 and a fragmentary beak and proximal end of a carpometacarpus which form the holotype of the fairly large Marinavis longirostris Harrison and Walker, 1977, are too incomplete for a reliable identification (see also Steadman 1981; Mlikovsky 2002). Feduccia and McPherson (1993) described a distal tibiotarsus from the late Eocene of Louisiana (USA), which they considered to be most similar to that of the extant taxon Pterodroma (Procellariidae). Argyrodyptes microtarsus Ameghino, 1905 from the late Eocene/early Oligocene of Argentina is based on the distal portions of a tibiotarsus and a femur, and was assigned to the Procellariidae by Agnolin (2007a), who thus confirmed earlier identifications of this fossil (e.g., Tonni 1980). "Larus" raemdonckii van Beneden, 1871 from the early Oligocene (Rupelian) of Belgium is known from an incomplete humerus that bears a large dorsal supra-condylar process. The species was transferred from the charadriiform Laridae to the Procellariiformes by Brodkorb (1962), who proposed a classification into the extant taxon Puffinus; procellariiform affinities of "L." raemdonckii were also assumed by Miller and Sibley (1941). As yet undescribed remains of procellariiform birds from the late Oligocene of North America were mentioned by Olson (1985). The Diomedeidae have no unambiguous published Paleogene fossil record. Panteleyev and Nessov (1987) described a putative albatross from the middle Eocene of Uzbekistan as Murunkus subitus. This species is much smaller than any extant albatross and is based on a carpometacarpus only. Without further material its phylogenetic affinities probably cannot be assessed, but it is more likely that M. subitus belongs to the Diomedeoididae (see below) than to the Diomedeidae. An incomplete tarsometatarsus from the late Eocene La Meseta Formation of Seymour Island (Antarctica), which has not yet been figured, was considered to be from a representative of the Diomedeidae by Tambussi and Tonni (1988). The material assigned to Manu antiquus Marples, 1946 from the late Oligocene of New Zealand consists of a furcula and tentatively referred incomplete femora. This albatross-sized species was assigned to the Diomedeidae by Marples (1946), from which the furcula is, however, clearly distinguished in the much more expanded shafts. I consider this classification to be unjustified, and the specimens may belong to the Pelagornithidae, whose furcula is still unknown. Olson (1985) mentioned an as yet undescribed specimen of the Diomedeidae from the late Oligocene of South Carolina. 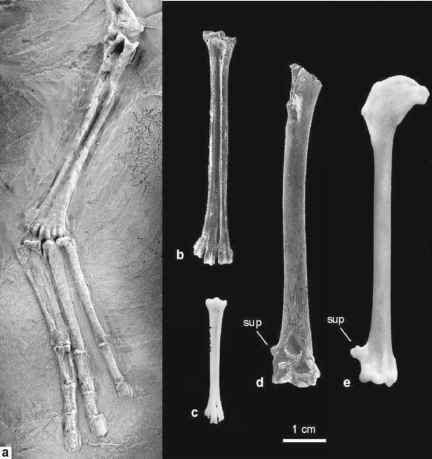 The only Paleogene procellariiform birds with a substantial fossil record are the Diomedeoididae, which are known from isolated bones and articulated skeletons from marine Oligocene deposits of Germany, France, Belgium, and Iran [Cheneval 1995; Fischer 1983a, 1985, 1997, 2003; Peters and Hamedani 2000; Mayr et al. 2002; Merle et al. 2002 (erroneously assigned to the Pelecaniformes; C. Mourer-Chauviré, personal communication)]. Three species are currently recognized, i.e., Diomedeoides lipsiensis (Fischer, 1983) and the smaller D. ("Frigidafons") brodkorbi (Cheneval, 1995) from the Oligocene of Europe, as well as D. babaheydariensis (Peters and Hamedani, 2000) from the Rupelian of Iran. Diomedeoidids were further reported from the early Miocene of Germany (Cheneval 1995; Mayr et al. 2002). All fossils of the Diomedeoididae were found in marine sediments, and these birds are actually the most common seabirds in the Rupelian of Europe. Mayr et al. (2002) showed that some remains were misidentified by earlier authors and that the name Diomedeoides is likely to be a junior synonym of Rupelornis. The latter taxon was originally proposed by van Beneden (1871) for Rupelornis definitus, a species based on a distal tibiotarsus from the Rupelian of Belgium. From the published illustrations, I further conclude that "Vanellus" selysii van Beneden, 1871, which is represented by a distal humerus from the Rupelian of Belgium, is also a representative of the Diomedeoididae and probably conspecific with R. definitus. An incomplete proximal humerus, which was assigned to the Anseriformes by van Beneden (1871, Fig. 4), may also belong to the Diomedeoididae, and there are many further undescribed diomedeoidid bones in the collection of the Brussels Natural History Museum (personal observation). The Diomedeoididae are best characterized by their highly peculiar feet, whose greatly widened and flattened toes with "nail-like" ungual phalanges are strikingly similar to those of the extant Polynesian Storm-petrel Nesofregetta fuliginosa (Oceanitinae) (Fig. 7.7; see Fig. 5 in Mayr et al. 2002). Within extant Oceanitinae, widened phalanges also occur in Fregetta and Pelagodroma, but are absent in Garrodia and Oceanites. The legs of the Diomedeoididae are very long as in the extant Oceanitinae, but in other skeletal features they are clearly distinguished from southern storm-petrels. The wing proportions are like those of extant Procellariidae, whereas the wing of the Oceanitinae is proportionally much shorter. Apart from being considerably larger, Diomedeoides further differs from all extant Hydrobatidae in its longer and more slender beak, the much more marked temporal fossae, the presence of incisions in the caudal margin of the sternum (which is entire in all extant Hydrobatidae), and the morphology of the hypotarsus (Cheneval 1995). Of these features, at least the entire caudal margin of the sternum is a derived character, which is shared by Nesofregetta and other Oceanitinae but is absent in Diomedeoides. The tip of the beak of diomedeoidids is further less hooked than that of extant Procellariiformes. Page 2002; Hackett et al. 2008). Possibly the Diomedeoididae were less adapted to sustained gliding but rather employed flap-gliding like extant Oceanitinae (Pennycuick 1982). The feet may not only have served as a brake for rapid stops when the bird caught sight of prey near the water surface, but, immersed in the water, may have also facilitated a stationary position against strong winds.